While traveling recently, I had the occasion to browse a local newsstand looking for some light reading and, as usually happens, I ended up browsing the culinary magazine section. 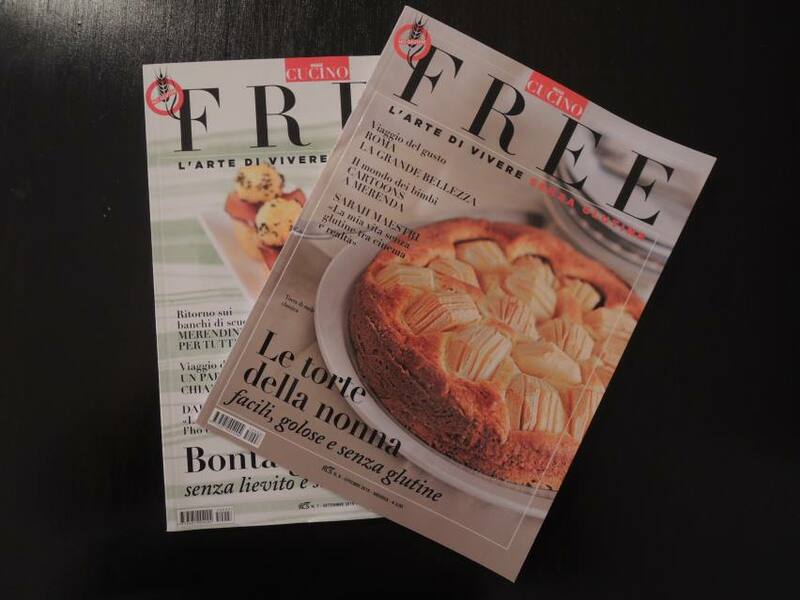 All of a sudden, my eye landed on a very pleasant surprise: a new monthly gluten-free Italian culinary magazine! Filled with enticing photography, some travel articles, and loads of inviting recipes, for the first time since going gluten-free, I felt I could finally leaf through a guilty pleasure of mine without starting to do gluten-free conversion calculations in my head. It was, quite simply, the best vacation present ever: another opportunity to forget my dietary limitations. The magazine, put forth by Oggi Cucino is called Free: L’arte di vivere senza glutine, which translates to “Free: The Art of Living Gluten-free.” It is on its eighth issue this month and costs only 3,90 Euro, which makes it one of the most affordable gluten-free treats (in fact, you can get it almost at half-price if you subscribe). Monthly sections include a list of recommended gluten-free events, a question and answer section for the Italian Celiac Association experts, and articles on ingredients, travel destinations, chefs’ recipes, and other themes. Some recipes call for flour mixes and others use single flour ingredients. Travel articles include itinerary recommendations for gluten-free eating and lodging as well as major not-to-be-missed monuments. The magazine does contain advertisements, as is to be expected with most major magazines, but they are for gluten-free products and services. In short, the magazine is a simple delight of a read and, at least for now, I am hooked! You can find them on the official website for the magazine.